When I sat down to write this post, I remembered the catchphrase of the American Egg Board in their 1980's public service announcements on TV promoting eggs. Eggs are indeed, incredible and what makes them so is their truly limitless power of transformation in cooking. Apparently they are now considered "Nature's Miracle Food". Cuisines around the world depend on eggs and without them, cooking is shackled. I know many people are vegans, and I have tried many egg substitutes and cooked vegan for years. But, in my opinion nothing so cheap and readily available is so vital to cooking well. Sauces, cakes, pastas, souffles, custards, tarts... all rely on eggs or whites or yolks to transform ingredients into delicious results. 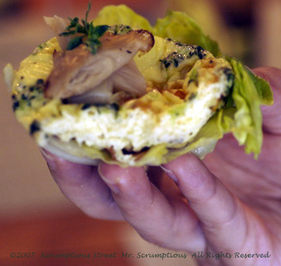 Think of all the egg dishes themselves that are boldly, fully, truly eggs and the list becomes overwhelming. 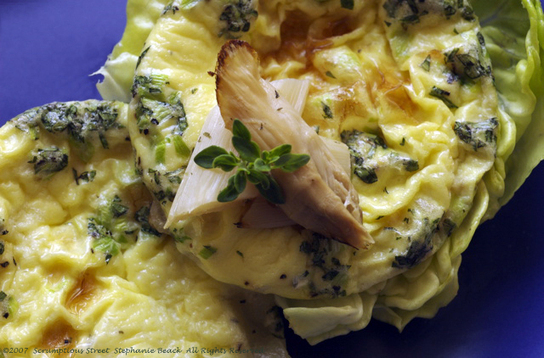 I am celebrating the egg today in a very tasty "White Asparagus, Fontina and Herb Frittata". It's a great joy for me to create fritattas these days because I haven't made them in YEARS. Why, you ask? Because I finally have wonderful skillets that are stovetop and oven proof and I finally have a kitchen large enough to store all my new pans and appliances worthy of it all. What joy to make this fritatta and not flip it over into an omelet, but put it into the oven and make a proper crust on both sides and have light yet dense texture in the middle. Here's my recipe for White Asparagus, Fontina and Herb Frittata. Pre-heat oven to 350 degrees Farenheit. Whisk together the eggs and kosher salt in a small bowl. Take out a small oven-safe skillet (and possibly non-stick if you like although in a well-used skillet this isn't necessary) and heat 1 T. of the olive oil on the stovetop on medium-high. Add the onions and saute until they are transluscent. Reduce heat to medium and add fresh herbs, ground pepper and cook a minute or two until the mixture is fragrant but do not let the onions begin to turn brown. Remove from heat and spoon the mixture into a large bowl and allow it to cool. When cooled, add in the eggs, white asparagus and fontina cheese and mix thoroughly. Add 1/2 tablespoon olive oil to the skillet on medium heat and when it's hot, pour in the egg mixture. Reduce the flame to medium-low. Let the eggs cook until the bottom forms a nice light-brown crust, about 3-4 minutes. Slide a small rubber spatula under the edge of the egg. If the egg comes away from the pan slightly, it's ready for the next step. At that point, remove the skillet from the stovetop and place in the middle of the pre-heated oven. Bake 14-16 minutes until the center of the eggs is firm and the top is a golden brown. Remove the skillet from the oven and let it cool slightly. Take a small rubber spatula and slide it all around the edges of the egg and under the bottom to loosen it from the pan. Place a plate over the top of the skillet, invert it and give it a little shake so that the frittata falls onto the plate with a soft thump. 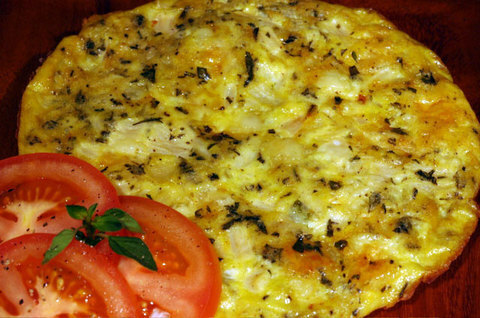 Lift off the skillet and garnish the frittata with more fresh herbs, cheese or fresh tomatoes. You can serve this either warm or at room temperature. It was a simple and delicious meal, perfect with a glass of sauvignon blanc. You can make endless varieties of frittatas, and try different cheeses-- goats cheese, brie, mozzerella-- just make sure they are soft ones which melt nicely. You can also add any number of herbs or aromatics and whatever vegetables you really like. I also enjoy wild mushrooms, roasted red peppers and different onions like shallots or leeks.